Aston Villa's Jack Grealish has turned down a place in the Republic of Ireland squad for the friendly against England and Euro qualifier against Scotland. There was speculation that the in-form midfielder would be called up by Republic boss Martin O'Neill but Grealish, 19, asked not to be included. 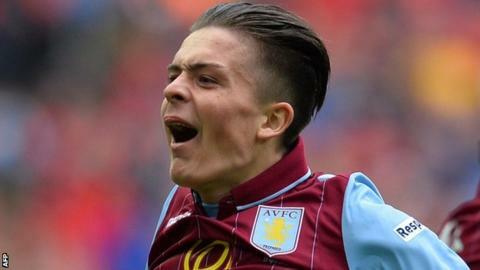 Birmingham-born Grealish can also play for England although he has already represented the Republic's Under-21s. "Jack didn't want to make up his mind at this stage," said O'Neill. The Republic manager said he had spoken to both Grealish and the player's father. A "disappointed" O'Neill confirmed he had intended to include Grealish but added that he still believed "there is a good possibility" the midfielder will play for the Republic. "He didn't want to make a decision now. I would have liked to have had him training with us for the week ahead of England game. That's a disappointing aspect." O'Neill's press conference to announce his squad was delayed by around 40 minutes. Asked whether this was because he had been in conversation with Grealish's father, O'Neill replied:"Not necessarily." O'Neill's side face England in Dublin on 7 June before the vital home Euro 2016 qualifier against Scotland at the Aviva Stadium six days later. Grealish is believed to be on England Under-21 boss Gareth Southgate's radar although the teenager has said he plans to play for the Republic's Under-21s in their Uefa qualifier against Andorra on 8 September. Earlier this year, Grealish suggested he wanted to delay a call-up to the Republic of Ireland senior squad until next season. Grealish earned positive reviews for his display in Villa's FA Cup semi-final win over Liverpool last month and has continued to impress in recent games for his club. O'Neill has given first senior call-ups to Aberdeen striker Adam Rooney and Brentford midfielder Alan Judge as he named an extended 33-man squad for the games which will be preceded by a behind-closed-doors game with Northern Ireland on 4 June. Everton midfielder Darron Gibson (foot) and Aston Villa defender Ciaran Clark (medial ligament) are both ruled out by injury but Robbie Keane is included despite concerns over a groin problem. Republic skipper Keane has not played for LA Galaxy for a month because of his injury. O'Neill will reduce the squad before the players link up on 1 June.